This small table has a handy little drawer at the top, for things you like to have within reach. The large open space at the bottom is great for books or stuffed toys or why not add a small decorative basket? South Shore is proud to stand behind this 1-drawer nightstand with an exclusive 5-year limited guarantee. Shop with confidence knowing your purchase is always covered. All our products meets or exceeds North American safety standards and our packaging are tested and certified to reduce the risk of damage during shipment. This item is shipped in 1 box, make sure to have a friend with you. Assembly is required by 2 adults and tools are not included. If you have questions regarding this product or need assistance do not hesitate to contact South Shore Furniture 7 days support. This product is made in North America with laminated particleboard and MDF. Accessories not included. 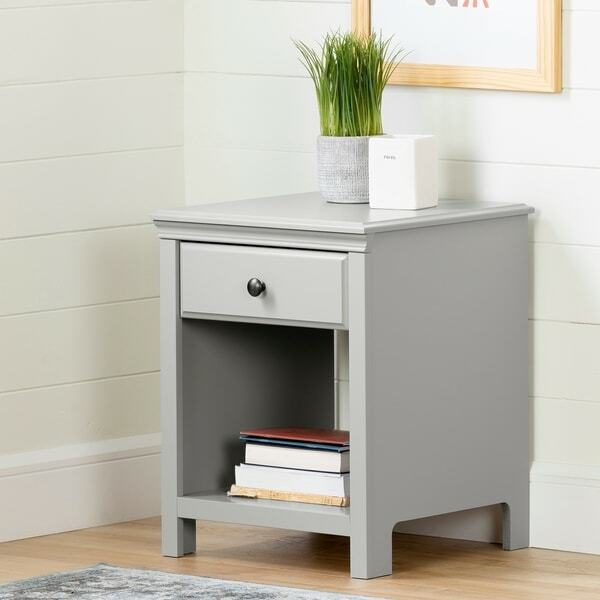 WORKS WITH A NUMBER OF STYLES: This little night stand, with its totally stripped down look, can go nicely with different styles and decors. You can easily picture it as part of a Cottage, Traditional, or "By the sea" look. A VERSATILE TABLE: This piece looks good on all sides - no need to put it against a wall. It's a great night stand, of course, but you can also use it as an accent table, next to a sofa. Dimensions 17.75 In. X 17.75 In. X 22.5 In.